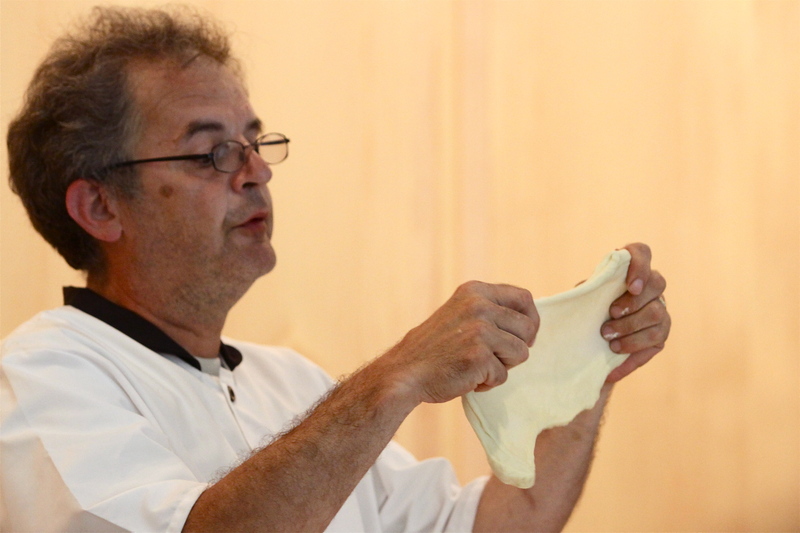 Master baker Denis Granarolo was back on board this week leading the demonstrations for the “Cooking with Local Ingredients” series at the Princeton Public Library, along with Eno Terra’s Chef Christopher Albrecht. I have failed to mention in previous posts that not only is Albrecht the Executive chef of Eno Terra, but he oversees all of the Terra Momo restaurants! With that said, blueberries and strawberries were today’s highlighted ingredients. Granarolo walked us through making croissants. Before he started the dough, he flattened 3 sticks (12 oz/339 gms) of butter into a six-inch square and placed it in the refrigerator for two to three hours. The butter needs to be chilled and at least 80% fat. 83% or 85% are more desirable for the best results. In the U.S. the brand Plugra (82%) is great to use for this purpose. Next he started the croissant dough. He added flour, salt, sugar, yeast dissolved in warm water, warmed milk and half & half in a stand mixer, and blended it with a dough hook until a ball was formed. He added a little more flour to form a soft, but not sticky dough. He tested it by stretching it to make sure it didn’t break. The dough must be covered with a damp cloth and chilled for four to six hours. The dough was then placed on a floured table, and pressed into a 10 inch square. The butter was placed on top, and the dough was folded over it, and it was rolled out with pin. If the dough or butter gets too soft, it should be placed back in the fridge. It was turned then folded into thirds and turned & rolled again three more times. It must be chilled for one to two hours, then rolled and chilled again a couple of more times. The master baker called this a laminated dough. This is achieved by rolling the butter into layers of the dough, which in turn makes it flaky. Albrecht commented that this is a “short” bread because the fat of the butter wraps itself around the long gluten strands and makes a more tender baked product, as in shortbread, shortcake, etc. This is a time and labor intense dough, but it’s so worth it! 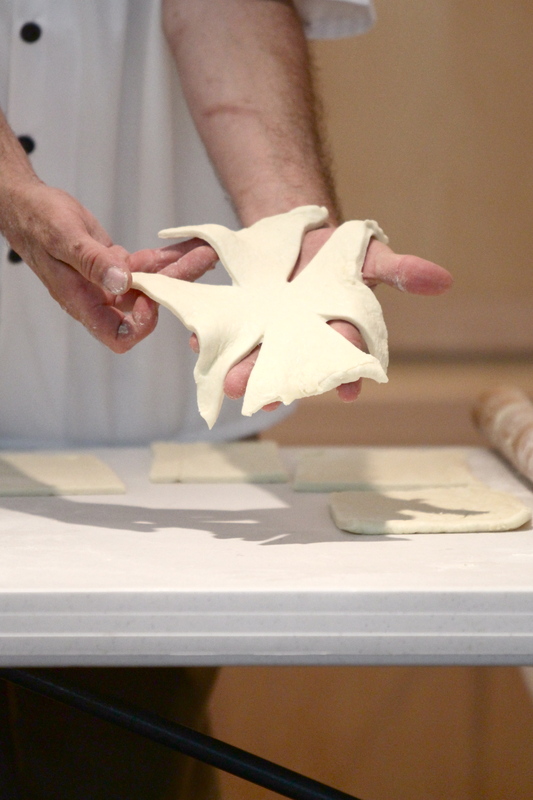 Granarolo rolled the dough out one last time into an 8″x18″ sheet and cut it into different shapes. The tradition elongated triangle with a slit on the short side for rolling croissants, a cross shape for making pinwheels, and a long rectangle for filling with pastry cream and fruit. He also prepared a strawberry bread using strawberry puree, eggs, sugar, oil, vanilla, flour, baking soda, baking powder, cinnamon, nutmeg and salt, and sprinkled the top with sliced almonds. 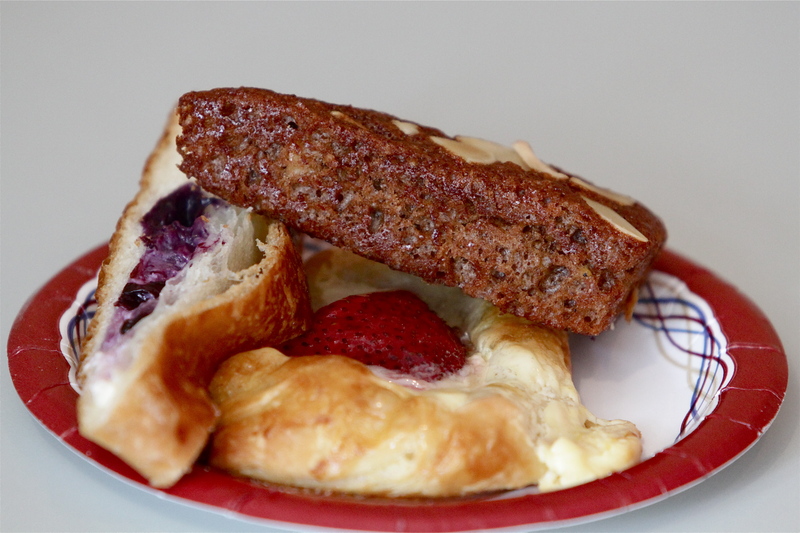 A slice of it is shown below, along with a slice of blueberry & pastry cream filled croissant, and a strawberry pinwheel. If you can get to the Witherspoon Bakery in Princeton, it’s worth the trip to indulge yourself in these tasty treats. They’re heavenly! Otherwise, please get to your local bakery and look for golden croissants with or without fresh fruit baked in. You won’t regret it! Yum! 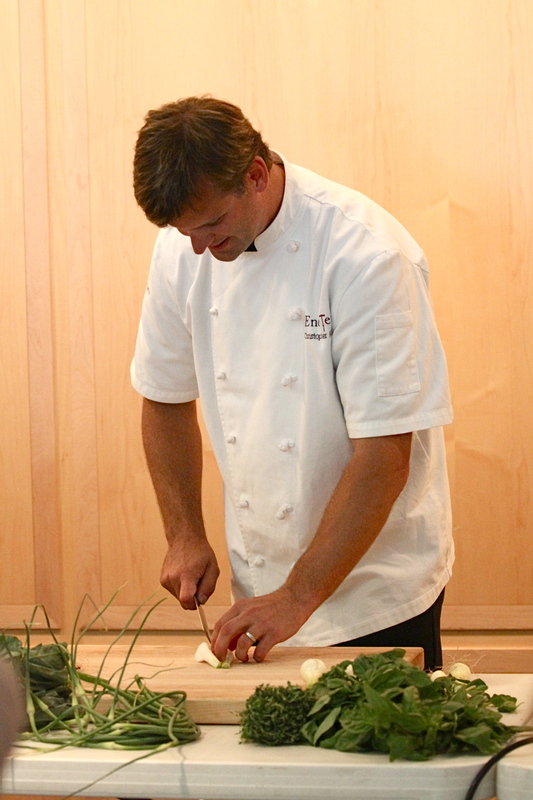 Eno Terra’s Chef Christopher Albrecht was in command again this week for the third installment of the “Cooking with Local Ingredients” series at the Princeton Public Library. After walking through the farmer’s market, he chose yellow and green zucchini, beets, fennel, and garlic scapes to showcase. He started with beets, showing us many varieties. 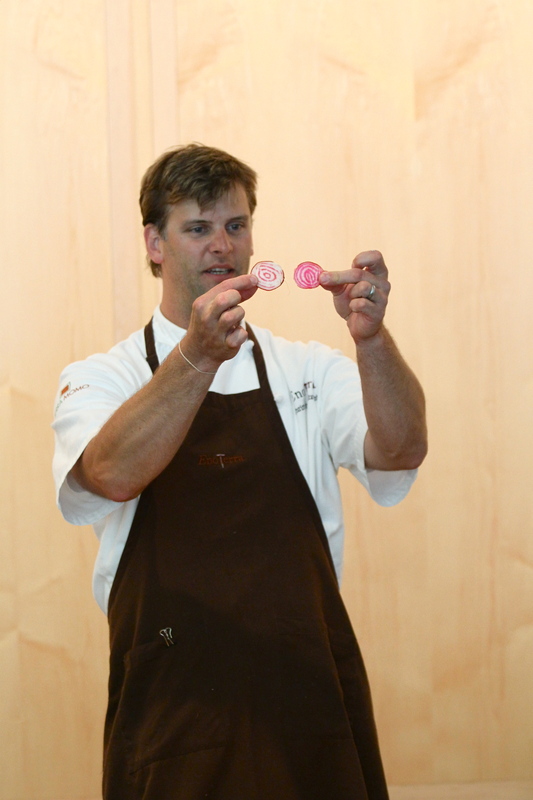 Albrecht cut a candy cane variety in paper thin slices with a Japanese mandolin to show us the beauty of this vegetable. Carpaccio is an Italian dish of thinly sliced meat or fish. Beef is the most popular meat used for this preparation, often topped with extra virgin olive oil or a vinaigrette, freshly ground pepper, and shaved parmesan cheese. 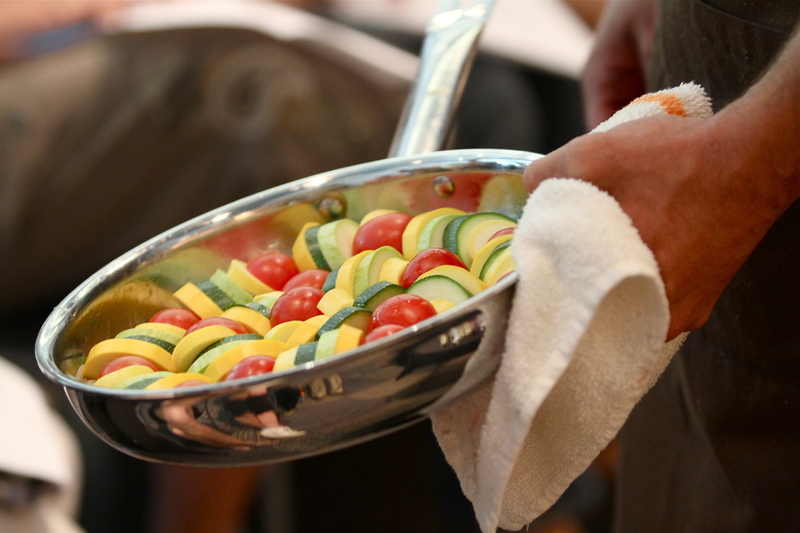 Albrecht finely sliced veggies using the mandolin and prepared a yellow and green zucchini carpaccio with all the accoutrements. The chef demonstrated a French cooking method called en papillote, which allows the food to steam in its own juices in a parchment or foil pouch. 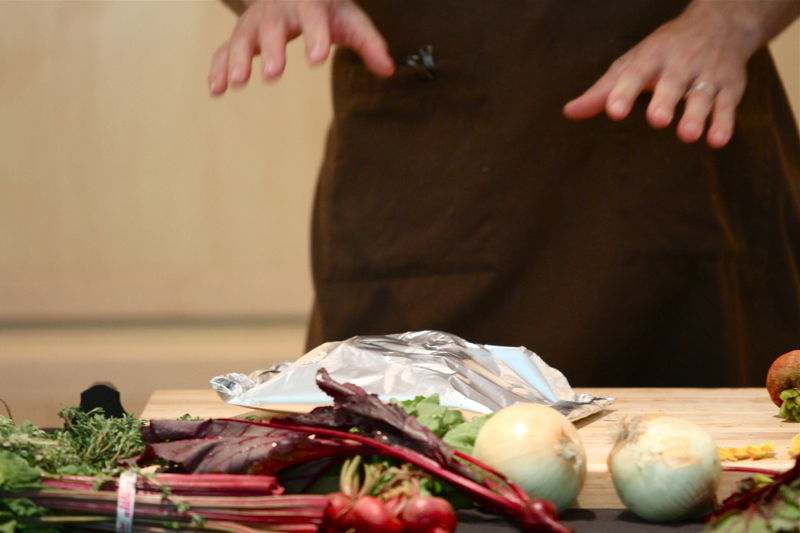 He placed whole red beets on a sheet of foil, seasoned them, and folded the foil in thirds over the vegetables, then folded the ends. Due to time constraints, he couldn’t fully cook the beets within our schedule, so his sous chef returned with diced pre-cooked beets for us to taste. Confit is another French method Albrecht used, which is the oldest way to preserve food. It is most often associated with duck or goose cooked in its own rendered fat. He did a small dice of zucchini, placed it in a stainless steel pot, covered it with olive oil, and slowly cooked it so the vegetable softened, but still had texture. We were given a taste of this dish, and though it was good, it needed the brightness of some acidity to balance it. Gratin rounds out the trio of French cooking techniques used today. Food is placed in a casserole type dish for presentation or a baking pan, often sprinkled with grated cheese or bread crumbs on top, and baked under a broiler until the crust is browned. A recipe was given for a summer squash gratin containing sweet onions, fennel heads, zucchini, yellow squash, plum tomatoes, thyme & rosemary leaves, grated Parmesan cheese, goat cheese, extra virgin olive oil and salt & pepper. Above are the veggies before baking in all their bright colors. Below is after seasoning and cooking. Everything was placed in a cup for us to sample. The colors were beautiful and each preparation was delicious! So far, I have not been disappointed with this series. Sometimes I cycle through the same meals monthly. These cooking classes remind me of all the great food out there waiting for me to cook, like fennel which I love to eat, but never cook myself. 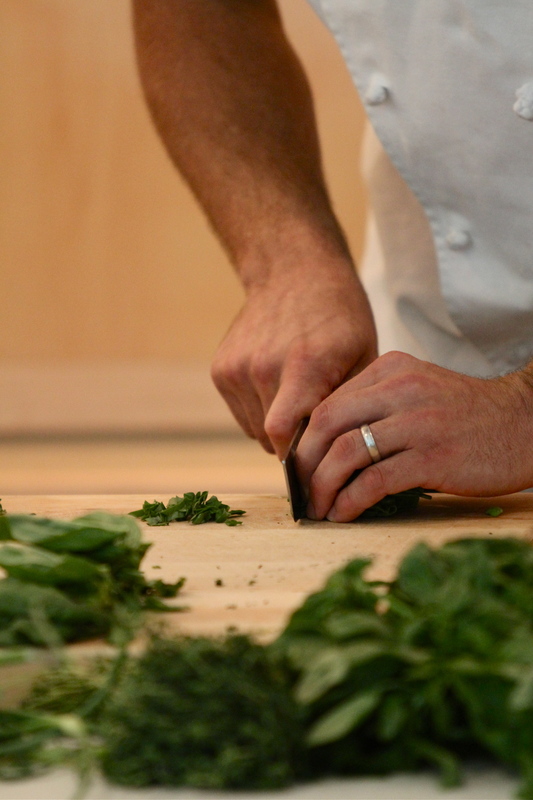 No matter where you live, sign up for a cooking class, or go to demonstrations to freshen up your repertoire. You won’t regret it! The Witherspoon Bread Company is part of the Terra MoMo Restaurant Group located in Princeton, NJ. This artisan bakery is known for its handmade breads and baked goods, and Master Baker Denis Granarolo, who hails from France, continues with the old world tradition of the slow process. 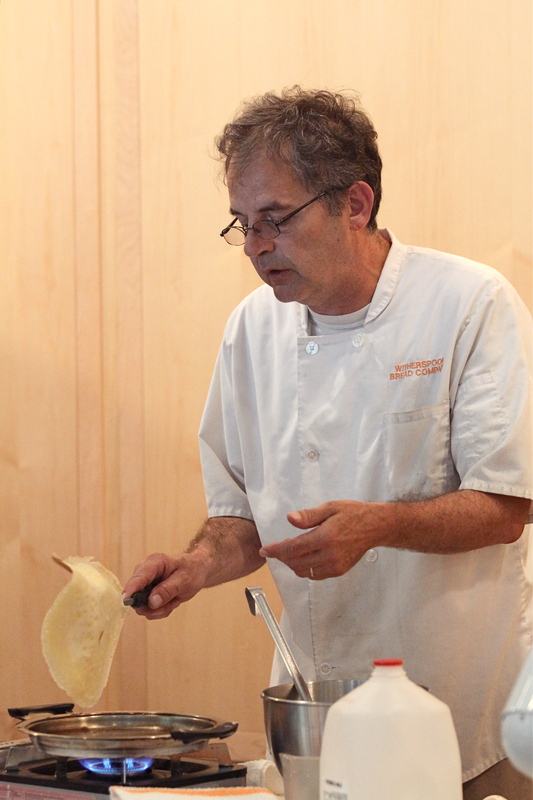 Continuing the series “Cooking with Local Ingredients” at the Princeton Public Library, he was assisted by Eno Terra’s Chef Christopher Albrecht in making sweet and savory crepes. Recipes were available as print-outs for everyone to follow. All of the produce used was locally grown, and most came from organic farms. The farm to table movement is growing stronger with an increase in farmer’s markets. When you buy local, the fruits and vegetables are picked when they’re ripe and delivered quickly to area markets and restaurants who demand the best. There’s nothing better than knowing where your produce comes from. At the farmer’s market, you can actually ask the grower about the crop. When you find a favorite, you can continue to purchase from that farm to insure fairly consistent quality. 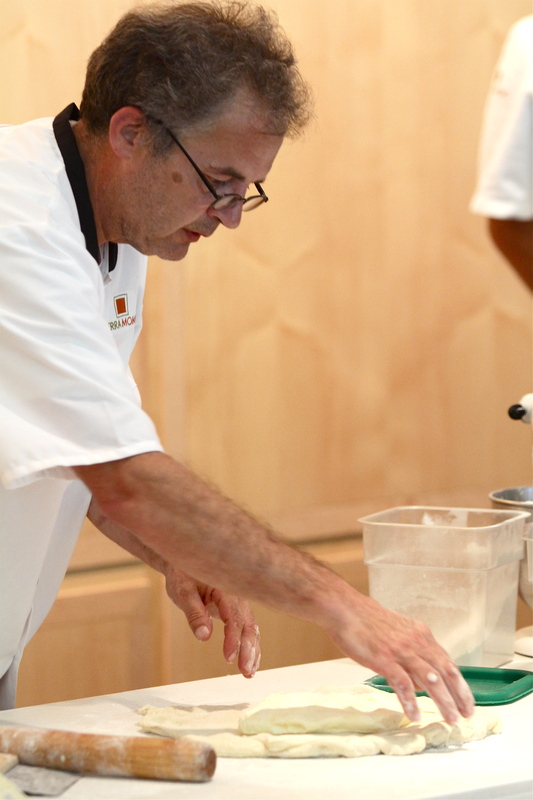 Granarolo demonstrated how to make a crêpe batter with the simple ingredients of milk, eggs, water, oil, flour and salt. He emphasized that it should be allowed to rest refrigerated for 30 minutes to overnight. Albrecht explained how to season a stainless steel or cast iron pan to make it a non-stick surface while Granarolo prepared some crepes. A ladle of batter was poured into the middle of the pan and then swirled around to completely cover the bottom. A few minutes later it was flipped over, and after a total cooking time of about 4 – 6 minutes it was done. Albrecht shared his strawberry jam recipe, and made an herbed ricotta cheese filling for the crepes. He stressed the importance of not cutting herbs when adding them at the end of a recipe to keep all of the oils in tact, allowing for concentrated bursts of flavor in your mouth. The master baker showed us how to make a quiche dough, and talked about the importance of using chilled butter. The custard was prepared with half and half and eggs. 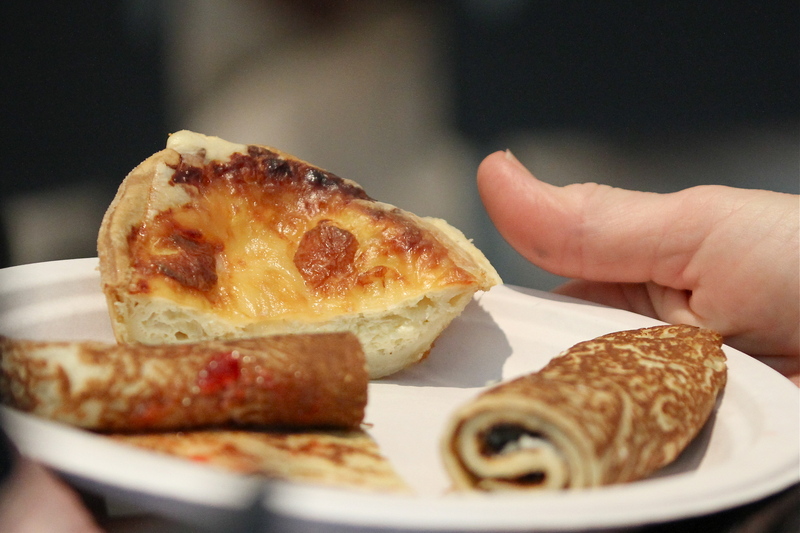 Due to time constraints, he couldn’t actually bake the quiche, so he had plenty of mini ones available for tasting. He pre-baked three varieties: onion, mushroom and ham. I asked him about the prep of the mushrooms, and he said they must be cooked and drained before adding to the custard, otherwise all the liquid will be released into the egg mixture and make it a runny mess. We were all given half each of a mini quiche, a savory herbed ricotta and a sweet strawberry jam filled crêpe, as well as some cherries grown on a small farm just over the Delaware River to sample. Talk about good eats! 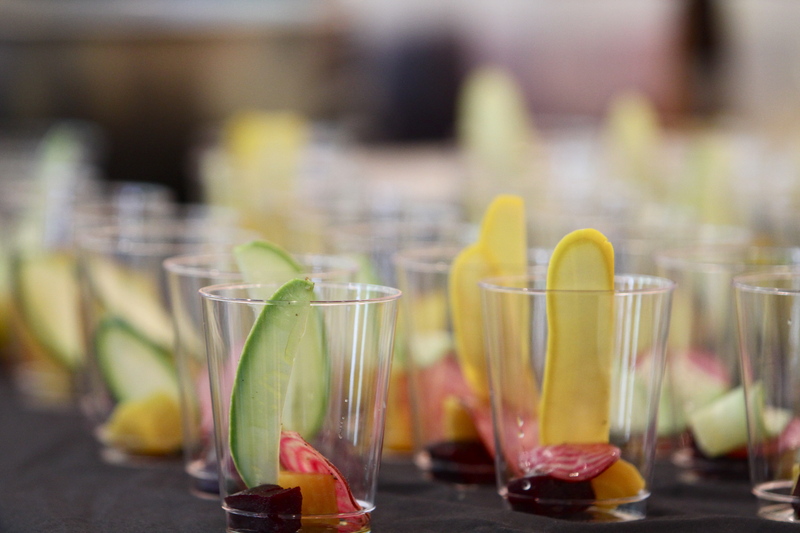 Attendees asked the chefs questions, conversed amongst themselves, and sampled great food made with attention to detail. The portion was just enough for a small meal, so I left the event with a more informed brain, and a fuller tummy thanks to Terra Momo and the Princeton Public Library. I am absolutely loving this series! It has truly been an inspiration to me. A special thanks goes to Janie Hermann, The Princeton Public Library Program Coordinator. I don’t know she pulled this off, but she rocks! Eno Terra is part of the Terra MoMo Restaurant Group based in Princeton, NJ. This restaurant is founded on the premise of using local, seasonal, and artisanal food. It’s located just outside the home base, in Kingston. This is an ideal location, just between New York and Philadelphia, and gets to benefit from the abundance of local farms just outside these two major cities. 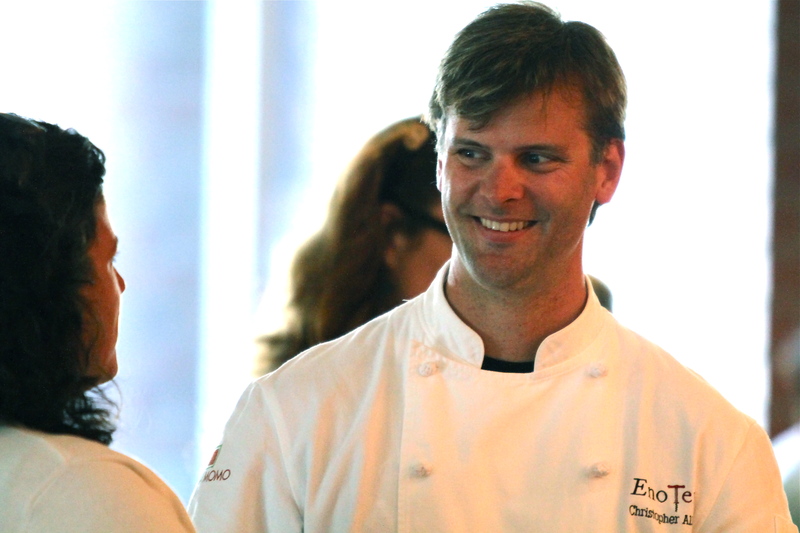 At the helm is Chef Christopher Albrecht. They have teamed up with the Princeton Public Library to offer one of the hottest tickets in town, and it’s FREE! 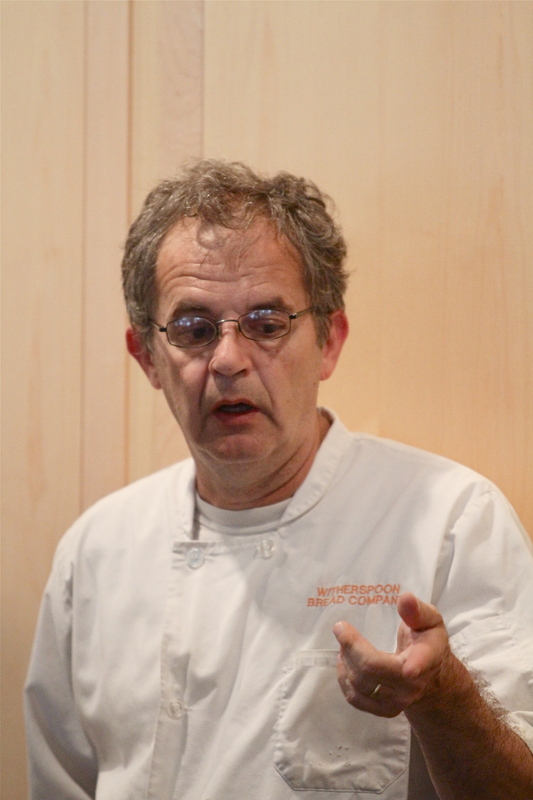 Starting the series of “Cooking with Local Ingredients”, Albrecht discussed supporting local farmers; the difference in freshness between produce locally and globally grown, and buying organic food. Most of the produce used was grown locally. Many came from organic farms. With an increase in farmer’s markets, the farm to table movement is growing stronger. Many chain supermarkets sell produce owned by large corporations, which package items to be shipped; therefore, they are not ripe yet when picked. When you buy local, the fruits and vegetables are picked when they’re ripe and are sold quickly because they don’t have to be transported far. The results are fresh, tasty food, mostly cared for by family-owned businesses who rely on the reputation of their produce. Also, when you buy local, you eat seasonal foods which are more flavorful and reasonably priced than globally grown, greenhouse produce. New Jersey is called the “Garden State”, so it would be a pity to live here and not get the freshest, most delicious food grown. The first cooking class started with a bang. There were three recipes given, and the Eno Terra chef covered them all explaining the ingredients and techniques used in preparation. This was strictly a demonstration with the bonus of everyone sampling his creations. Need I mention it was a full house? To start with, he made a white and a red pickling liquid. Radishes were looking good at the market this week, so he pickled them in a red liquid, which also enhanced their color. He passed out raw radish slices, and pickled ones. I don’t particularly like radishes, but I found his pickled version quite tasty. Have I become a convert? Next up was sweet shrimp, sugar peas, garlic scapes and sorrels. The sugar peas had a great snap, and a nice aroma. The garlic scapes, which sort of look like really long scallions/green onions had a nice mild scent, and the sorrel, which resembles spinach, had a nice body to it, so you could tell they were super fresh. The sorrel paired nicely with the shrimp since they have a citrus flavor. Olive oil was used to sauté the ingredients, and it was seasoned to taste. This was absolutely delicious! Last, but not least, he made a ribollita, which is Italian for reboiled (leftover minestrone soup was re-heated with chunks of bread). The seasonal vegetables used were Swiss chard, garlic scapes, Tuscan kale, mustard greens, zucchini, and a leek. Other ingredients used were a red onion, a celery stalk, potatoes, carrots, cannellini beans, tomato paste, 2 days old Tuscan bread, thyme, a bay leaf & basil puree. This rustic soup would satisfy anyone’s hunger, and I couldn’t stop eating it. Although I must admit, I personally don’t like the texture of “soggy” bread in soup, though I understand it’s role. I think I’ll just puree 1/4 of the beans to use as a thickening agent, and perhaps put a slice of toasted Tuscan bread on top as my version of this delish dish! I was very pleased with this event. It’s not a hands on cooking class, but it does inspire you to go to farmer’s markets, buy the freshest fruits and vegetables, and create healthy and tasty meals for your family and friends. I give the series two thumbs up so far, and I can’t wait for what the following weeks will bring! What’s Cooking With Chef Sara Moulton? Sara Moulton released her cookbook Sara Moulton’s Everyday Family Dinners earlier this year, and is on a book signing tour. This former Food Network celebrity chef is even giving cooking demos and classes in select locations on her tour. I was fortunate enough to be at one of her demos, and let me tell you, she’s as witty as she is talented in the kitchen. This wasn’t a dull demo of just reciting the recipes, she had stories, told jokes, gave tips, and answered questions without missing a step. Sara Moulton’s show Cooking Live was one of the first shows I watched on the Food Network. It’s a shame they took it off the air to make room for more food-related shows. I think it’s important to also have real chefs showing technique and giving tips, but maybe that’s just me. She can now be seen on Sara’s Weekend Meals which airs on PBS in most areas on Saturday mornings, so check your local listings. As you’ve probably guessed, the book was inspired by the new show. During the demo, she put together a non-traditional lasagna which used sliced polenta instead of lasagna noodles. For dessert, she prepared a chocolate cheesecake which she microwaved. Both recipes are included in the new cook book, and tasted great. She asked us if we knew the two irreversible kitchen disasters. Some thought adding too much salt. She explained that could be fixed by adding liquid. After we seemed stumped, she gave us the answers. 1. You can never recover from burning food. 2. You should never purée potatoes in a food processor, because once they’re over whipped they because a gluey mess, and the texture cannot be restored. She also shared the three conductors of flavor. 1. Water 2. Oil and 3. Alcohol. She has even conducted a taste test of Penne à la Vodka with and with the alcohol. Sara emphasized that vodka itself doesn’t have flavor, but it imparts so much in the sauce, that makes a big impact on taste! Before she started cutting onions for the lasagna, she put on a pair of special glasses. Sara, who is also the Good Morning America Food Editor, told us these goggles prevent your eyes from tearing up. In the clip below, it’s shown as one of the featured gadgets. Chef Moulton also shared her thoughts on two ingredients. First, she is NOT a fan of canola oil due to the fact that the non-organic varieties are modified. She prefers using grapeseed oil. The second bit of information she shared was about salt. She prefers using Kosher salt because of the feel of it. It’s easy to take a pinch and know how much to use without measuring. I totally agree. She even compared brands, mentioning that Morton’s uses additives and Diamond Crystal does not. Wow, I didn’t know that, but good thing I’ve ALWAYS used the latter! If Sara Moulton comes to your town, do yourself a favor, and watch her in action. Not only do you get to watch a Culinary Institute trained chef do what she does best in your presence, you also get to see a side of her the camera doesn’t always capture, and it’s priceless! Father’s Day will be here before you know it. As a mother, I am usually the one to cook the meals. I like to avoid going out on these days, because it’s overly crowded, and the service is not up to the same standard. I’d prefer a relaxing atmosphere. This year, I will have my kids prepare the meal with some guidance. The menu has been set, and they will actually have fun making it, and a sense of great accomplishment after they prepare the courses of this meal. As long as one child is over 10 years old, they can pull off the entire feast with just some help with the dessert and perhaps cutting. The menu is a three-course meal for a family of four, which includes: Butternut squash soup, spring mix salad with apples, candied/glazed walnuts and feta cheese with a raspberry walnut vinaigrette, grilled salmon and mock crème brûlée or fruit tartlets. First Course – Butternut Squash Soup: Two boxes of McKenzie/Birds Eye Southland Butternut Squash (frozen). This is actually a seasoned puree, and tastes fantastic. Lift one corner of each box, and place them in a microwave at full power for about 8 minutes. In the meanwhile, heat a can of your favorite chicken broth/stock (about 8 oz.) in a pot, and then add the butternut squash. To serve, ladle the soup in four serving bowls, and you may optionally garnish with chopped fresh chives or toasted pumpkin seeds and a dollop of sour cream. Second Course – Spring/Mesclun Mix Salad and Grilled or Broiled Salmon Filets: Pre-heat George Foreman grill/panini press or broiler. Cut 1 1/2 lb. salmon filet into equal portions, making sure there are no bones left. If so, take tweezers to pull any remaining ones out. Season with salt and pepper, and rub a very small amount of olive oil on each portion. Place on a George Foreman grill/ panini press for about five minutes and in the broiler for 8-10 minutes, turning over once halfway through. While the fish is cooking, open a bag of pre-washed spring/mesclun mix salad greens and place four portions into a large bowl. Add crumbled Feta cheese, diced apples, and candied walnuts. Toss with Ken’s Steakhouse or Newman’s Own Raspberry Walnut Vinaigrette. Place one portion salad on each plate next to a salmon filet. Pour a little Virginia Brand Vidilia Onion Vinaigrette on fish or next to it. You can substitute the vinaigrette with a tiny bit of butter and herbs on top. Third Course – Mock Crème Brûlée: This is so easy to make. Open four cups of Hunt’s Vanilla Snack Pack Pudding, and place in a mixing bowl. Add the seeds of a vanilla bean or 1/4 tsp. of vanilla extract. Divide into four ramekins or very small oven proof bowls/tins. Sprinkle a layer of sugar on top of each. An adult will have to do the next step. If you have a kitchen torch, torch the sugar until brown . If you are using a broiler, place on the top rack until brown. When done, place into the fridge until served. 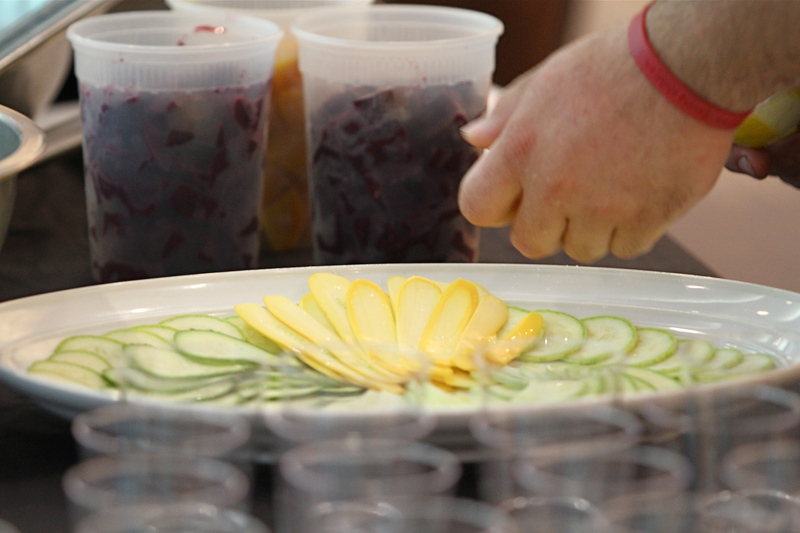 Second Option – Mock Fruit or Chocolate Tartlets: This is even easier. Open two cups of vanilla or chocolate pudding. One pudding is good for two pie shells. If using vanilla, divide in four mini graham cracker crusts in metal pie pans, then add fruit on top. Cut strawberries in halves or quarters. If using chocolate, add to shells, and grate white chocolate over each for contrasting color. I hope the fathers enjoy this meal. You can always substitute ingredients, i.e. pears for the apples, blue cheese instead of feta, change the type of fish or use steak or chicken breasts, etc. Good luck!